A Fun Filled Week On Captain Johnny's Ship! This wonderful cruise came about quite by accident. It all began with a pair of airplane tickets that we got for free the year before when we voluntarily gave up our seats on a flight... in order to get free airplane tickets. Now, we had to use these within a year, and time was running out. We also each had a week long vacation left to us and no planned trips. So, we decided to investigate (what else?) the possibility of another cruise. We knew it would be hard to top Liberty of the Seas done just six months previous, but so what? It was a cruise opportunity... always impossible to pass up! 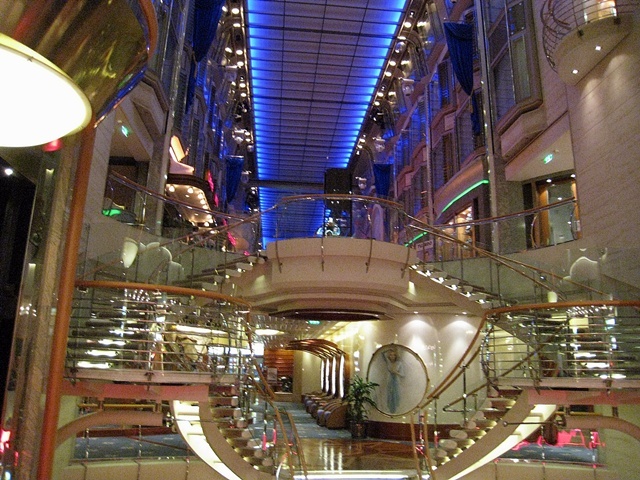 By this time, Diane and I had cruised on 3 of the 5 Voyager class vessels: Voyager, Explorer and Navigator of the Seas. Only Mariner and Adventure of the Seas had eluded us. Navigator and Mariner were the last two Voyager class ships built, and as such, they got some interesting upgrades over their older sisters. We thoroughly enjoyed the Navigator, so we decided to give Mariner a look. The timing was very fortunate for Mariner was leaving the east coast to take a long cruise south and down around the southern most tip of South America and then back north to California (she and her Voyager class sisters are too large to pass through the Panama Canal as of 2009) where she would be based going forward and doing west coast Mexican cruises similar to our Vision of the Seas cruise. If we wanted to do a Caribbean cruise on Mariner, this was going to be our last chance. As usual, we worked with Karen Beldner, our TA extraordinaire, to make arrangements for a cruise to the eastern Caribbean from Sept 14th to the 21st. Because this was hurricane season, cruise fares were exceedingly cheap. Hey, if you're willing to gamble, you can save a bundle. (Always get cruise insurance for any cruise, but especially get it for cruises during hurricane season!) Our airfare cost us about $50 each using the free flight vouchers (free, as long as the dates aren't blacked out... there was a surcharge to use it on the dates we wanted, but that was fine. It was still a bargain to fly roundtrip from Philly to Orlando for $50/person). So, Karen got us booked in a "D" cabin on deck 8 aboard the lovely Mariner of the Seas. We flew to Orlando on the day before the cruise and rented a car and drove to Cocoa Beach. We stayed at the Radisson at the Port hotel. This wonderful place is geared to the cruise vacationer and even provides free shuttles to the port. The grounds and the pool area and the rooms are all magnificent, and a night's stay there was only about $160... a true bargain. We checked in and took our car on a trek to Cocoa Beach (passing all sorts of aerospace firms) and plunked down at a nice beach park. Later we drove to KFC for dinner (hey, we'd be eating like royalty the rest of the week) then back to the hotel for more pool time. 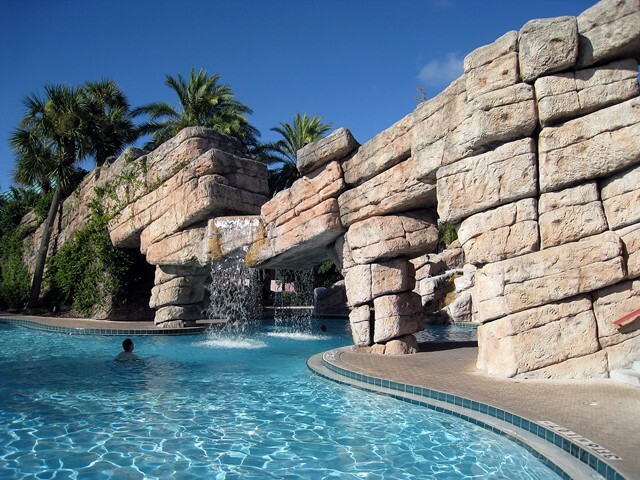 Radisson at the Port's Magnificent Pool Area! Embarkation in Cape Canaveral The next day, we dropped off the car at the rental place about a block from the hotel and they shuttled us over to the Port for free! The driver was very knowledgeable about the port and gave us some interesting commentary. There was a Disney ship and a Carnival ship in port that day, but we only had eyes for the sparkling white Mariner of the Seas. The driver told us we'd love her Captain... Captain Johnny... and he was right! We dropped off our luggage and breezed through security then sat briefly in the waiting area until we were all cleared to go aboard! We were aboard by 11:30am and as usual, we proceeded to Chops Grill and Portofino's and made our reservations for 7pm on Monday and Friday. Then it was off to the Spa for our cruise massage appointments for Tuesday morning. (One of the advantages to taking so many cruises is that you learn how to get things like this out of the way early.) Then we got up to the Windjammer for our typical first meal at the ship's buffet. We found a table with commanding views of Cape Canaveral... very distant, but the Shuttle Assembly Building was clearly visible... and the Carnival Sensation and the Disney ship. First View (from cab) of Mariner at Port Canaveral... Disney ship at right. After lunch we got into our cabin and changed into our bathing suits and headed to the main pool. There we met Bill and his sister Gwen (who kept looking for Basil, the drinks waiter... where was he?) and their family. We really hit it off with them, laughing about things going on around the pool area, including one poor older gentleman who had a bathing suit "malfunction". (For details, email me) In no time at all, it was time for everyone to go to their muster stations for the perfunctory drill. This was over quickly (always a good sign that fellow passengers on your cruise are intelligent). Diane and I then double back to our cabin to drop off our life preservers and head on forward to the bow where we planted ourselves for the launch. Mariner sailed smoothly along the little water highway to the ocean passing many fun looking clubs in Cocoa Beach and on the opposite side, the top of a submarine coming out of the ground on shore. My father tells me that's a retired one when I ask him about it after the cruise. Our wonderfully positioned table in the main dining room! Day One: This day was spent on RCCL's private island, Cococay in the Bahamas. While not as advanced as RCCL's other private resort at Labadee, Haiti, this place has improved immensely since our last trip there. We got up around 8am and got down to the beach via tender from Mariner and found some excellent loungers down at the water's edge under some very shady palm trees. The day was warm and sunny, and the water temperature was warm. Diane snorkeled and was thrilled to see lots of exotic fish! I saw a stingray swim by,,, and I wasn't even snorkeling. Excellent water clarity is the norm in the Caribbean. Later we went to the BBQ that is provided here, then to the point looking out to the ship (see the photo at the top of the page) then we did some light shopping, followed by the tender back to the ship. Back on the ship, Diane relaxed in the Solarium while I worked out in the Mariner's excellent gym facility. I still think all of the Voyager and Freedom class ships have the best gyms afloat... and even better than most land facilities for that matter. This night was formal night, and we had dinner at Chops Grill where we feasted on magnificent T-bone steaks. Before dinner, we caught up with our new friends, Ronnie and Sal in the Concierge lounge and talked about the cruise. After it was off to the show to see the talented Greg Bonham! After this, we made some donations to the Casino, then went to the midnight comedy act to see Jeff Burghart. An excellent day! Chops Grill specialty restaurant... don't miss it! Day Three: This was our day at St. Thomas, USVI. 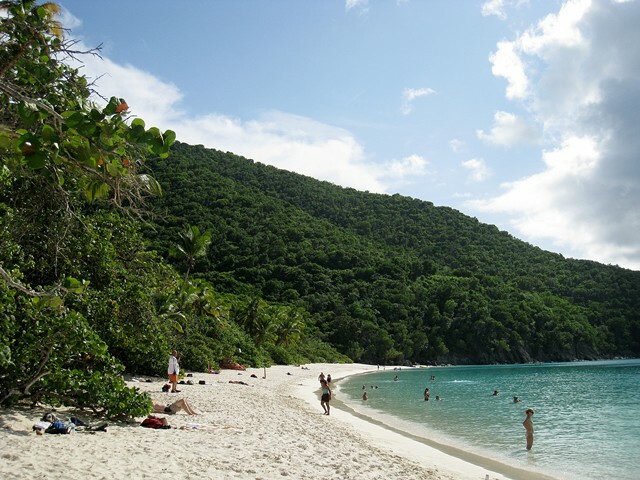 Normally, we get off the ship and take a cab right over to Magen's Bay... if you want a long beach day, this is the place to go in St. Thomas. 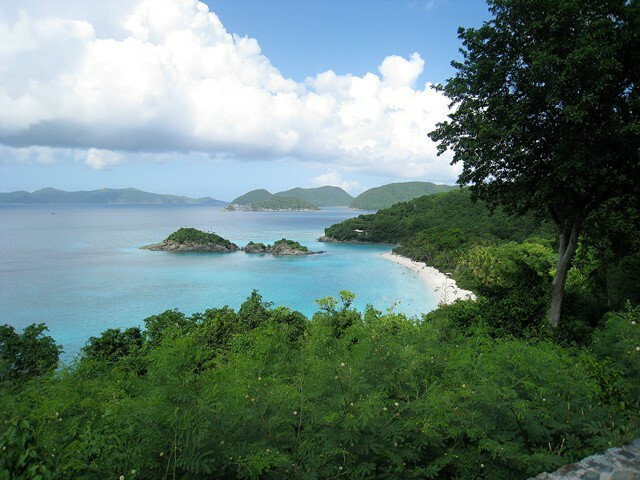 But this time we decided to take the St. John and Trunk Bay tour. In the morning, we went shopping in the Haven Sight Mall right at the docks, then came back to the ship for a quick bite in the Windjammer before the tour. The ferry to St. John departed around 1pm and after a delay due to some Carnival passengers arriving late, we were off on a wonderful mini-cruise between the Virgin Isles! Along the way we saw beach island properties said to belong to Michael Jackson and Madonna. After about an hour, we arrived at St. John (we hadn't been to this island since the late 80s) and an open air bus took us to the incredibly beautiful Trunk Bay where we had several hours to snorkel (equipment provided as part of the tour) and swim in the incredibly clear water. Diane and I both snorkeled... Diane more so. She saw thousands of fish and enjoyed it immensely. We'd forgotten just how beautiful this beach is... and it's now pushed St. Martin's La Playa Beach at Orient Bay into second place from it's former top spot in our favorite beaches list. If you ever have the opportunity, go to Trunk Bay. It's worth every penny! The boat ride back to St. Thomas was a little drizzly, but this didn't take away at all from the magnificent day. This night, the Concierge Lounge had a second area in the Viking Crown section opened up for Concierge guests (RCCL has now dubbed this area the "Diamond" lounge) and we went there and ran into Sal and Ronnie then went to dinner in the main dining room. After dinner, we walked the Promenade then went to the ship's bow and had a romantic view of the full Moon. We skipped the deck party and made it an early night (all of the day's traveling left us tired) to bed. Trunk Bay, on the beach! Day Four: St. Martin! I think this was the only cruise to St. Martin where our ship was the only one in port! The day started out drizzly and overcast on the Dutch side of St. Martin, but we decided we wanted to get in a full beach day anyway since we didn't have much of one here back on our Liberty of the Seas cruise six months before... so as usual, we piled into a van with three other girls and took the ride up to the French side's La Playa Beach at Orient Bay (our favorite spot on St. Martin). As often happens with these Caribbean islands, the French side, while overcast all day, saw only a few scattered sprinkles here and there. Overall it was much drier there. The overcast day and the fact that Mariner was the only ship in port, made for a wonderfully deserted beach. This is a rarity on the Orient Bay Beaches! They never even bothered to charge us for the loungers at La Playa. We still ate a nice lunch at the restaurant there and spent four hours enjoying the beach! After, we returned to the little shopping complex at the port and did some light shopping. Around this time, the Sun finally popped out and made for a great late afternoon doing some line dancing around the pool. Later, I worked out while Diane prepacked and watched the sunset. We partied with Sal and Ronnie in the Dragon's Lair disco after dinner, then took a walk to the bow to look at the stars then later Diane and I hit the Casino where I (predictably) lost some money playing video poker. An almost empty La Playa Beach at Orient Bay! Wow! Day Five: An at Sea day! As Crown and Anchor members, we had a free pass to Johnny Rockets... the Voyager/Freedom class hamburger joint. As I've said in other reviews, I find the burgers here to be mostly substandard. The fries and onion rings and malted shakes (additional charge for shakes) are very good and the floor show the team in there puts on is always fun, so since we have the free passes, I make a stop here on each cruise. (Otherwise, I doubt I'd darken their door. Five Guys on the main land knows how to make burgers!) So we did lunch here after sun bathing in the morning. Later, I power walked on the track (burn calories, burn calories, burn... oh, what's the use?). In the later afternoon we went to the ice show... my notes show it was 2 out of 5 stars, so I guess it wasn't that spectacular. For dinner we went to the always spectacular Portofino's and had (what else?) a spectacular meal! After dinner we went to the ship's only production show. It was their first night doing it, and again, it didn't seem to knock our socks off as we only gave it a 3 out of 5 stars. Our travel agent, Karen Beldner, sent us a bottle of wine, so we popped this open and had a glass or two, then headed over to the always fun Schooner Bar. Next we took some pictures around ship (like to do this late when people are sleeping and the ship is empty) and made our nightly donations to the Casino. Day Six: Another day at Sea (I love these)! This was the laziest of lazy days for us... we started out by eating breakfast on the balcony, then we went back to sleep till 1pm! We then proceeded to the Windjammer for a last lunch up there and then spent the day at the main pool. The seas were rough and the ship was heading directly into the wave crests, so the entire ship had a forward to aft roll going on... it was a LOT of fun. The pools had their own wave action going on with water leaping up and down and carrying you with it... adults and kids were making the most of this as if it was some planned ride. By night, it was clear that they would have to refill the pools since so much of the water got thrown out onto the decks. Never saw this before, but it was a lot of fun! (Typically, some teenage boys had to be taken out of the pool as they tried to do stupid tricks with the rising waves in the pools... I guess I was an idiot, too, way back in the day.) I did my final workout in the gym, then we went to the Solarium for the balance of the day. That night in the Concierge Lounge we met "Mario" who is on just about every Royal Caribbean cruise... this Mariner sailing was his 150th! He's a great guy... he asked if he could sit with Diane and me and we were quickly trading stories about cruising. We always wanted to meet Mario as he's almost always one of those people the Captain introduces at Welcome Back parties who has been on high numbers of cruises. After, we went to our last dinner with our tablemates and made all our tip commitments and then we packed. Later, we caught up one more time with Sal and Ronnie and watched some terrible karaoke performances. Water coming out of main pools, drenching deck! Much larger waves than this! Day Seven: Goodbye Mariner! Disembarkation went smoothly enough and we were off the ship with our luggage very quickly... but unfortunately, for our ride back to the airport we hired (before the cruise) a shuttle company called Travelynx (formerly Art's Shuttle, who came highly recommended amongst some Cruise Critic members). I can't stress enough how awful this experience was with them. They were extremely disorganized in getting us to a shuttle and out of the port. In fact, it took them an hour and a half to get us on our way for what was a 45 minute ride. They kept putting us in vans packing our luggage in one then taking us back out and putting us in another, while we watched the van we were in leave for the airport... it was terrible. Next time, I'll do what we did on the first leg and rent a car to the airport... or better yet, I'll buy a transfer from Royal Caribbean rather than trust Travelynx. Don't ever use Travelynx. Once at the Orlando Airport, we had just enough time to grab some lunch and get on the plane home. What We Liked About Mariner: Everything... this was basically all we loved about the Navigator of the Seas in a newer ship. Her Captain, Captain Johnny, was super! His running commentary over the PA and different times of the day was simply hilarious ("those on the starboard side... if you look real sharp... you'll see Africa 3000 miles away..."). He did his own shtick rather than canned announcements. ("I hope you are all enjoying yourselves around the ship on this lovely day at sea... just thought I'd let you all know we are currently in the Bermuda Triangle...") He is an amazing fellow and he even wrote a book detailing his rise through the ranks of Royal Caribbean to become headmaster of one of the largest cruise vessels in the world. He isn't the least bit aloof as some ship Captains are... he could easily be seen eating in the Windjammer and walking about without the usual entourage of officers. He and his cruise director did an amazingly funny video about the cruise director's "cabin". Captain Johnny has a scooter he uses to get around the ship quickly. The food was always excellent, and more so in the specialty restaurants. The ship was beautiful and very clean. The gym was fantastic. The perfect Voyager class ship! What Needs Improvement: On this ship, during this week, the only thing I noticed was the lack of production shows with singers and dancers. Usually there are at least two and sometimes three production shows. We only had one, and it was debuting that cruise... and it was not good. Also, the Ice Show was only fair. Other than this, I can't think of anything really needing improvement on Mariner of the Seas. Do We Recommend Mariner? Absolutely! This was a classy ship with an unforgettable crew and an amazing Captain. Mario (the super-cruiser mentioned above) told me that with all his cruises, he's seen that it's the Captain of the ship and his leadership skills that trickle down to the crew and make for a wonderful cruise experience... and I could see he was right. Everyone working aboard Mariner referred to Captain Johnny with a broad smile... you could tell he was well liked. I saw Captain Johnny in the Windjammer one day and I approached him and told him he should be very proud of his ship and his crew and he was sincerely happy to hear it. Mario also mentioned that Liberty of the Seas (another favorite of ours) had a similar Captain. Alas, Mariner has been sent to the west coast as of 2009, so unless we decide we want to do another cruise to the western Mexico coasts (not real likely as airfare is a killer for us and we weren't all that enthused by the itineraries there) we probably won't be seeing her any time soon. 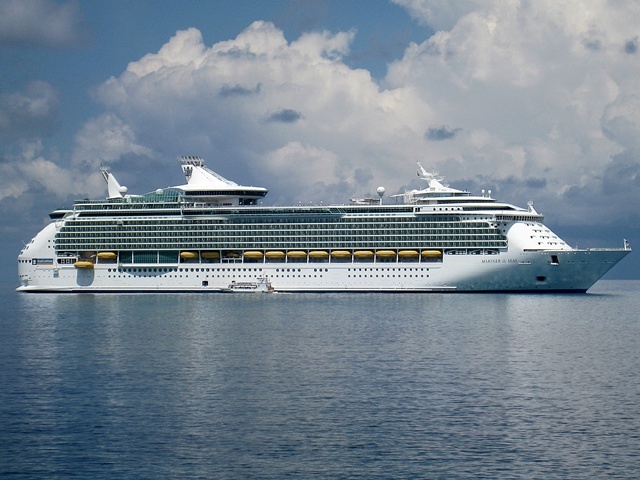 We wish her the best, and we whole-heartedly recommend this ship for your next cruise.